What Women Want is a substantial booklet published by Second Light Publications. Its key poem, a 10 page narrative, Caroline Norton, is about the dramatic and tragic life of this writer and society, who was Sheridan’s grand daughter. She was the first person in Victorian times to gain some rights in law for women. What she achieved paved the way for later reforms and she deserves to be much better known. There are other poems about women’s lives and a section of general and lyrical poems. 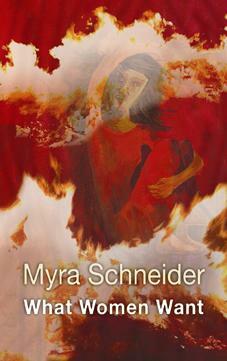 Myra Schneider's spirited new pamphlet focuses on the importance of getting things done - poems written, laws changed, the past confronted and challenged. While many of the poems record the terible injustices suffered by women throughout history, they are also a passionate call to action. Humming with Wordsworth's "force which rolls through all things" (quoted in her poem Cropthorne Church), they express Schneider's faith in the power of words to affect change. This faith is exemplified for Schneider by the extraordinary life of Caroline Norton whose enforced separation from her children led her to campaign tirelessly for a change in the law. The poem brings to vivid life an important piece of history, the first skirmish in the long battle for women's equality under the law. It's an inspiring story and Norton's spirit - anger tempered by a zest for life and a keen intelligence - informs the pamphlet as a whole. Even the more lyrical pieces speak of a "now" that "pushes you/ to your feet". It's refreshing to read a collection that argues, in the face of continuing oppression, that poetry really can make something happen. Here is a comment by Rosie Bailey and there are some more after the extracts. I particularly admired the Caroline Norton Poem: the sustained and quiet elegance of the form, which allowed for so much information without in any way seeming 'informative', and the clever use of 'what she did'…It's one of the finest poems I've read for a long time…'Losing' is a leisurely but striking analysis of a hauntingly difficult subject...not a dropped stitch anywhere. And that's true also of many of the others that I liked: 'Piano' another successfully handled (and very moving) narrative; and that a wide-ranging deceptively innocent little poem 'The Bowling Club', which is suffused with the lovely essence of suburban continuity… And 'Cropthorne Church' and 'Insanity' - indeed there so many delicately done pieces. I'm very grateful to have it [the collection]. It has given me so much pleasure, and will again. Here is an excerpt from the Caroline Norton poem followed by the first poem in the booklet. After Caroline Norton's brutal husband, George, had sued her for divorce and lost the trumped-up case he sent their three children to live with his hard-hearted sister in Scotland. At this time (1836) wives had no legal say whatsover in what happened to their children. Husbands could do anything they liked with them. This piece is about Caroline's reaction. to see a therapist - none of these existed. to fight, announced she was scotched but not killed. saw herself bucking and scrabbling to save her life. of the important events of this world of changes. she was introduced to Talfourd, a Whig barrister. who had been desperate to keep her children. assimilating facts, spotting holes in arguments. another whose children were awarded to a mistress. The plight of these women roused her sense of justice. more rights to an unmarried than a married mother. who didn't care a fig for the infants' welfare. has no claim to the children she has nursed? With her pen she set out to slaughter a draconian law. its quick screens, its cables packed under streets. at the foot of the hill where Grieg worked. of crochets and quavers. So why am I holding back? Months on, the composition hut is still in my head. but does self have any meaning on its own? of this dear planet as if it were my own heart's clock.